the pavilion today - so sign up now! but coming a cropper in 6 of the 8 singles. Our teaam: Rosie Richardson, Ina Norris, Hugh Crook & Don Rutherford. Chris Roberts & Frances Colman achieved handicap reductions at the three day 'Six Lawns' AC Tournament at Winchester, Littleton & Hamptworth at the weekend. Chris (now AC 7) defeated Frances (now AC 12) in the latest of their 'needle' head to head matches, but Frances still leads 2-1 this season tournament matches. Hugh Crook won our qualification event for the All England GC Handicap Competition today. Rosie Richardson was runner-up and the pair duly qualify for the Area Final South on Sunday 19th August at Hamptworth. Heather Masheter, who finished on the same number of wins as Rosie, finished third having lost out in their 'head to head' match. A possible conflict of dates could yet see Hugh standing aside and Heather go forward as our second qualifier. 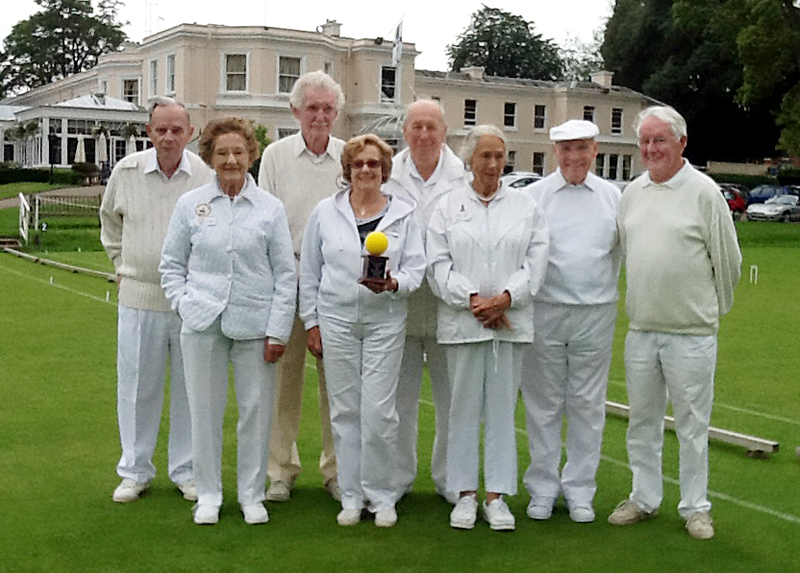 Undaunted by rain throughout this third league match, PCC 'B' kept their unbeaten streak going with an inphatic win 10-2 over Basingstoke today. The usual line up of Raymond Wood, Mike Fensome & John Chalfont were joined by Chris Roberts making as a late replacement for the injured Mary Gaynor. Our team finished 7th in this this inagural tournament at the Sussex County Club at Southwick near Brighton, which attracted 10 Club teams from all over the South-East Federation. We only won two matches (each consisting of a doubles & two singles games) in the 'all play all' first stage but this was enough to stave off possible relegation. 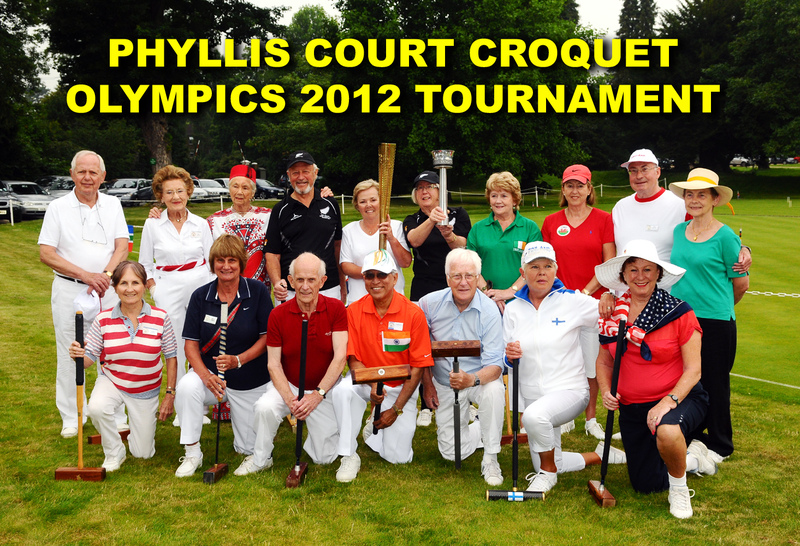 This was a far cry from our pre-tournamnet ambitions but enjoyable croquet nontheless against some low handicappers amid other very steady club players. 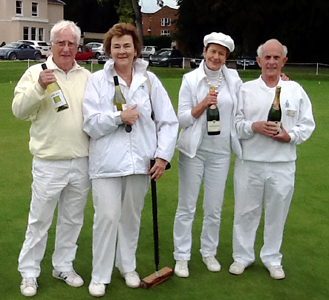 Our team was Charlie von Schmeider (Saturday only), Chris Roberts, Helena Fensome, Frances Colman & Raymond Wood. "It was worth admitting being 80, wasn't it!" laughed Rosie Richardson soon after winning our new 80+ Singles Tournament today. 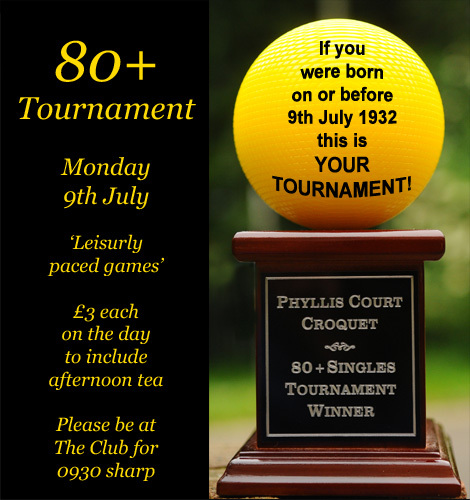 The winner of our latest trophy 'The Yellow Ball', was undefeated ahead of a field of 10 competitors, who could amass over 830 years between them! The surprise package of the event was relative newcomer Ray Broardhead, in his first season and first tournament, who can be very proud to have ended as runner-up. Amongst his victims was our President Smokey Eades who missed out on a place in the final by just that one loss. The whole event was played at a leisurely pace and, amid much laughter. 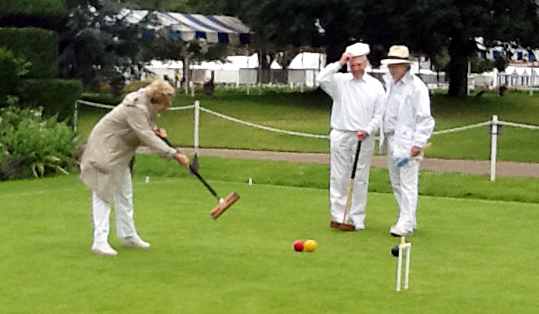 there was some surprisingly serious croquet going on. It seems that this Tournament, perhaps even more that the others that we have introduced, was particularly welcomed and enthusiastclly supported. How nice it was to be visited by former Chairman Ken Cotterell and Margaret. Waterlogged Courts forced the postponment of our eagarly awaited National Inter-Club Championship match v Broadwas today. This match will now take place on EITHER 6th or 10th August - watch this space. We have also lost our Club AC match tomorrow (Saturday) v Eynsham and, just to prove it's not a local thing, Chris Roberts' planned weekend at the Ryde Open on the Isle of White is 'off' because they have a lake where there courts should be! Monday 6th August - PCC 'A' v Harwell (SCF League) - Start time 1330. 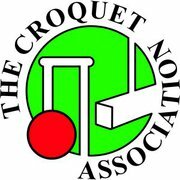 Friday 10th August - PCC 'A' v Broadwas (CA National Inter-Club Championship) - Start time 1030. 19th July - John & Jill win the Champers! 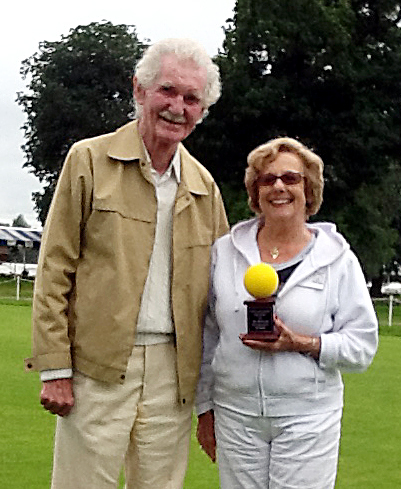 John Chalfont & Jill Hale won the second Drawn Partners Tournament today giving Jill her first single day event victory. 'nudgeing & nerdeling' skills to pilot Jill to this success. But it was a close run thing and the final went right to the last 'golden' hoop against Rosemay Noel-Clark & Don Rutherford. 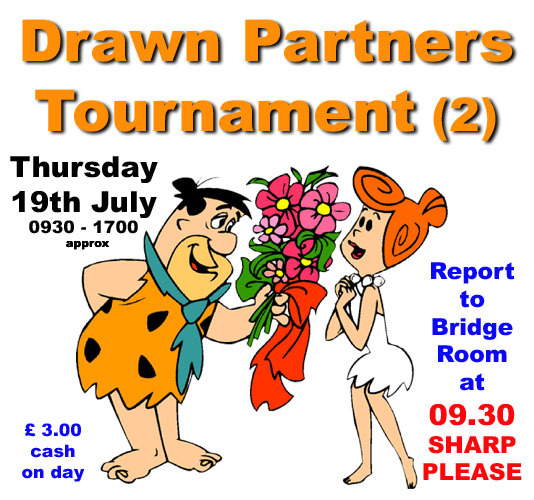 14 pairs competed over three rounds in this popular 'master and aprentice' style event. was really very well done indeed. With 13 'foreign' players set to represent their countries, there were three places availaible for those entering the draw for the right to represent England. The lucky ones pulled out of the hat are: Rod Falconer, Mary Chambers & Ann Attfield. Next drawn out was Dainne Brown and will be our reserve player. Please all come along and support our 'Olympians' next Friday 27th July from 1000 hrs. Our top team stumbled to defeat against Ryde today in a 'topsy-turvy' match that went one way then the other. And with this loss, so went any chance of a League title, as even a win in our remaining match against Harwell, won't see us overhall Champions elect Winchester. Ryde started this match really well with wins in the first ronud doubles, only to be pegged back to 2-2 in the second round doubles. It was still even after round three with singles victories from TJ Johansen & Chris Roberts but in the final round only Frances Colman managed to add another win as Roberts faded, TJ was blown away and Helena Fensome fought a rear guard action in vein. Ryde won 5 - 7. Honours were shared with Ryde the friendly fxture that ran alongside, with two excellent singles wins apiece recorded by team debutant John Kennedy and late stand-in Hugh Crook. Rae Kennedy also made her team bow alongside seasoned campaigner Anne Attfield. 20th July - First 'Triple Peel' at PCC for years! 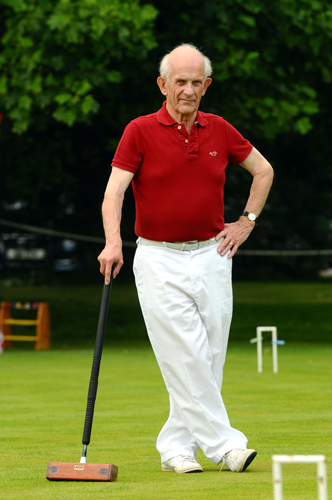 Charlie von Schmeider put on a flawlesss display of Advanced Association Croquet this evening to beat Chris Roberts +26 TP. Chris Roberts was restricted to just three shots and just had to admire Charlie's inch perfect play that is on another level entirely to anything we see at PCC. other ball to run the last three hoops AT THE SAME TIME !!!! - Really well played Charlie. 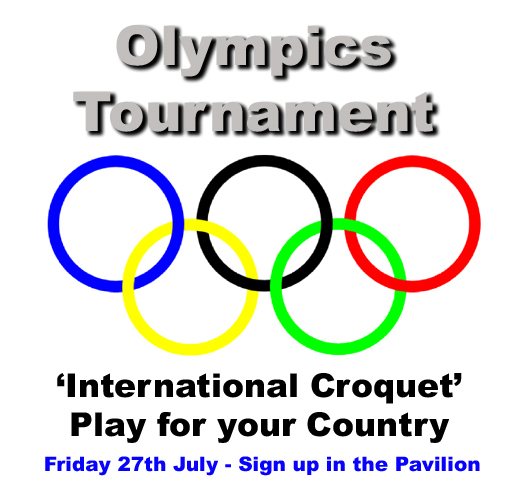 Do come along to support this event and cheer on our 'international players' - it should be lost of fun on the official Olympics opening day. 27th July - Finland win Gold at the Olympics! Finland lived up to expectations and duly won our Olympics Tournament today; perhaps our best event yet. Helen Fensome was moved to tears on the victory poduim as her National Anthem rang out and her flag was held high. John Chalfont rewarded organisers for is late call-up to represent England, by ending runner-up to the Finn. 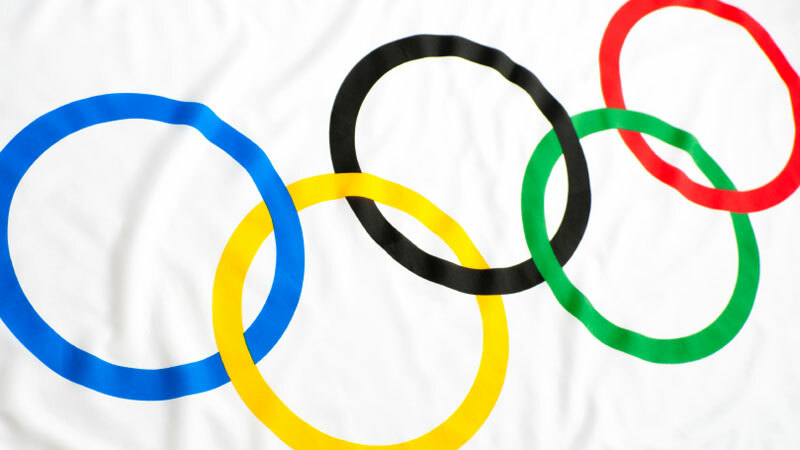 with everyone entering into the Olympic spirit. Raghu Iyer must have been up all night creating his Indian outfit! The All Blacks Rae & John Kennedy were last to arrive and made the best entrance when marching in beside their New Zealand flag. In front of courts bedecked in flags of the competing nations, co-organiser Frances Colman ran in with a genuine Olympic Torch (actually used in the torch relay only two days before) to really get things going. 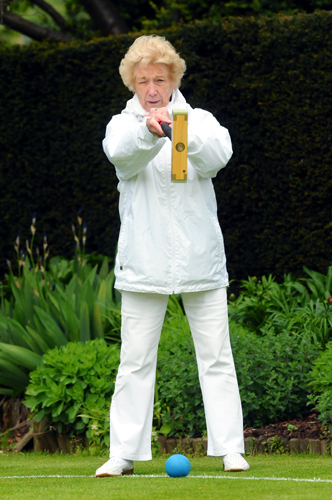 PCC Chairman Barry Hardman stood in for HRH The Queen to declair 'The Games Open', lit the Olympic flame that burnt bright throughout and then the croquet began. Most of the morning block games went with seedings with the noteable exception of Raghu Iyer who took India to an upset victory over Don Rutherford of Shetland. Along with Finland and England 1, the other blocks were won by the fancied Nations; Ireland (Mary Gaynor) and Wales (Dilys Earnshaw). Moving quietly under the radar New Zealand 1 (John Kennedy), England 2 (Anne Attfiled), South Africa 1 (Paddy Bunch) and India (Raghu) also 'made half-time cut'. In the afternoon, New Zealand 1 came to the fore with a 7-2 win over Ireland, as all the other block winners made it to the semis, which then produced the top two seeds fo the final. An injury forced Wales to stand aside from the third place game but in a nice touch New Zealand 1 favoured that they should share third place. And so to the final: Finland v England 1 (Helena v John C) and the former soon established a healthy 3 hoop lead which she held until the end, despite making a real meal of scoring the last for a 7-4 victory! Barry Hardman returned to watch the final and then to present the Gold, Silver & Bronze medals on a hastely errected podium on pavilion steps. It was lovely to see all the smiling faces throughout the Tournament and thank you again to eveyone for making such an effort to support a lovely day. For the full results click on this button. Two players are celebrating this week with drops in their handicaps indicating a rich vein of form. & and Rosemarie Noel-Clarke. A reduction in handicap from 7 to 6 was Heather's reward. himself a handicap reduction fro 5 to 4. Really well done both of you!